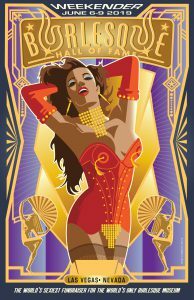 Lineups for this year’s Weekender showcases are now posted on the BHOF Weekender website, featuring more than 75 acts by the best performers the burlesque world has to offer. Watch an incredible lineup of the greatest performers from around the world compete for the crown in Saturday’s Miss Exotic World competition! See cutting-edge performers dazzle us with their ingenuity in Thursday’s “Movers, Shakers, and Innovators Showcase”! Watch a parade of burlesque royalty in Sunday’s “Icons and All-Stars” show! And be blown away by the Legends of the 40s, 50s, 60s, and 70s, the women and men who started it all, in Friday’s “Titans of Tease” reunion show! Visit BHoFWeekend.com/2019-showcases for the full lineup. Passes go on sale soon, so keep an eye on BHoFWeekend.com, and on our Facebook and Twitter feeds! And don’t forget to book your room at The Orleans! Go to BHoFWeekend.com/attend/hotel/ and book by April 28 (use group code A9BHC06) to take advantage of our special rate.